Are you a high net worth individual? Then the wealth management rules are different for you. Mark Tepper rightly assures us that we should all consider ourselves wealthy if we have the resources to live the lives we want to live without compromise. However, if you fall into one of his higher-net-worth categories, you will find that Exceptional Wealth is speaking directly to you. Tepper, author of the acclaimed Walk Away Wealthy, stresses that if you are someone with a high net worth, you have to realize that managing your wealth is complex. He clearly outlines key steps and sophisticated strategies that experienced professional financial advisors should be implementing for you. Each high net worth individual has unique and different forms of wealth, investments, and objectives. Consequently, individual and special family needs demand specifically tailored financial plans and approaches. Good investment management might have made you wealthy, but Tepper solidly brings home the point that only proper wealth management will keep you wealthy. 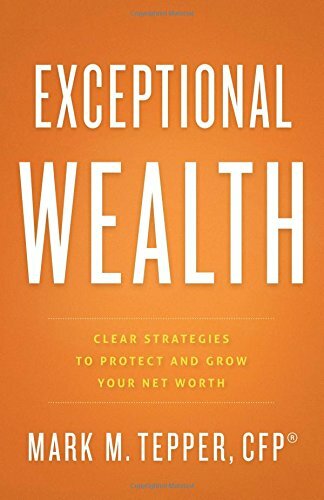 Those whose wealth exceeds $1,000,000 will likely benefit most from the keys and myths that Tepper outlines, but this book is relevant for anyone looking to take the next step in wealth accumulation and preservation. The bottom line, as Tepper advises, is the following: Prosperous individuals require a higher level of sophistication when it comes to optimizing their financial affairs. If you have any questions about this product by Greenleaf Book Group Press, contact us by completing and submitting the form below. If you are looking for a specif part number, please include it with your message.